“Exactly 25 years after my mother graduated from American University, I will take my first steps as a freshman on the very same campus as she once did,” says incoming student Isabel Wolff, SOC/BA ’22. 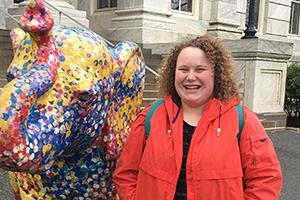 Isabel remembers an iconic photo of herself, from her first trip to AU in 2004, next to a speckled elephant in front of Hurst Hall. Years later, Isabel finds herself back on campus for an educational enrichment opportunity, Discover the World of Communication, to study international communication and professional newswriting under School of Communication faculty and communication professionals. “I was really interested in American because of its academic excellence and location in a metropolitan area with a dynamic city as an extended campus,” adds Isabel. The daughter of Fern Schrager, Kogod/BSBA ’93, and niece of Lisa Wolff, Kogod/BSBA ’89, Isabel is the 2018 recipient of the Alumni Association Scholarship and describes how attending American is a family affair. “AU is in my DNA!” she exclaims. Valuing education both in and out of the classroom, Isabel is excited to major in public relations and eager to join organizations such as Public Relations Student Society of America, The Eagle, Student Philanthropy Council, and AU Ambassadors – as they will allow her to share her enthusiasm for the university with others. The Alumni Association Scholarship provides financial support to students whose parent or grandparent holds a degree from American University. Renewable for a maximum of four years, the scholarship offers $5,000 per year toward tuition and is awarded based upon the student’s academic record, demonstrated leadership abilities, connection to American University, and an essay describing how their family members’ experiences at AU influenced their own decision to attend. In her essay, Isabel described being her mother’s “mini-me” as having similar personalities. “While I have always hoped that I would be able to outgrow this persona, I will never be able to shake it completely because we both will have had the privilege of attending AU. It is an honor to be a legacy student at American University,” says Isabel.